You are here: Home / / Rihanna, Chris Brown back together, Yes The Never Ending Love Song. Rihanna, Chris Brown back together, Yes The Never Ending Love Song. (ThyBlackMan.com) Cold weather, snowflakes and the holiday season makes many people long for their family, friends and past lovers. This time of the year causes many to want to cuddle up in front of the fireplace with that someone special. Well rumor has it that Rihanna is craving her some Chris Brown. Sweet memories of her holidays spent with Chris are resurfacing. Even though publicly they are not an item, people are saying that Rihanna is keeping her eye on her boo Chris Brown by secretly scoping out his Instagram account under the radar. This makes one wonder if she’s about to drop her latest man Travis Scott. Most likely not, since there are reports are all over the internet that Travis Scott and Rihanna are quite an item. Rihanna says her last boyfriend was Chris Brown and that was when they reunited in 2009 after he assaulted her. But now some folks wondering if Chris Brown is totally over his ex love, Rihanna. Chris Brown’s new album “Royalty” was released on December 18th. Some are wondering if one song in particular entitled “Day One” is an ode to Rihanna. Did Chris Brown pen a song on his new album ‘Royalty’ in order to win back the love of his life Rihanna? It sure seems that way according to the lyrics of his new song ‘Day One’ which is making some wonder if after all these years he still wants her back. 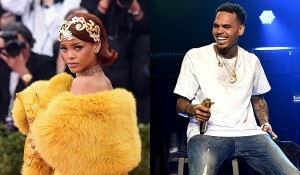 The track “Day One” seems to exude lyrics with Chris Brown professing his love to Rihanna. Maybe we’re all jumping the gun. Of course these lyrics could be for someone else. Take a listen to the tune yourself and you be the judge. For real yo! Same article all the time! If Chris brown is so damn famous and popular ( which anybody alive right now knows that he is everything but what I’ve listed, then just make a article about him being so great….. Which probably isn’t. Possible.